Kazbegi – Stepantsminda, commonly known as Kazbegi, is a small town in the north-east Georgia. It is well known and considered to be one of the must see destinations in Georgia due to amazing views of mountains and stunning nature. 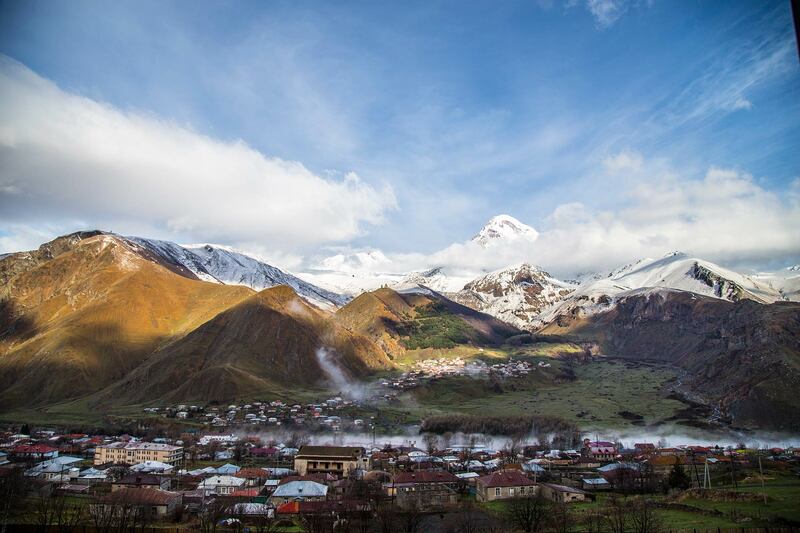 Kazbegi Mountain (or Mkinvartsveri) is the third highest mountain in Georgia, and is surrounded by myths and religious tradition. Kazbegi is a great place for ice climbing and mountaineering. Gergeti Trinity Church in kazbegi was built in 14th century. It is located on 2200 meters above sea level. The church is a popular way point for trekkers in the area, and can be reached by a steep 3 hour climb up the mountain, or around 30 minutes by jeep up a rough mountain trail. Ananuri is a castle complex on the Aragvi River in Georgia, about 45 miles (72 kilometers) from Tbilisi. It was a castle and seat of the eristavis (Dukes) of Aragvi, a feudal dynasty which ruled the area from the 13th century. The castle was the scene of numerous battles. The fortress remained in use until the beginning of the 19th century. In 2007, the complex has been on the tentative list for inclusion into the UNESCO World Heritage Site program. On the way you will visit Jinvali Water Reservoir and see an amazing view of the Gudauri sky resort. These places are known for it’s beautiful sights . Stepantsminda literally “Saint Stephan”, was named after a Georgian Orthodox monk Stephan, is a small town. The town is located along the banks of the Terek River, 157 kilometers (98 mi) to the north of Tbilisi. Stepantsiminda is known for its scenic location in the Greater Caucasus mountains, and is a center for trekkers and mountain climbing. Mount Kazbek is associated in Georgian folklore with Amirani, the Georgian version of Prometheus, who was chained on the mountain in punishment for having stolen fire from the gods and having given it to mortals. The location of his imprisonment later became the site of an Orthodox hermitage located in a cave called “Betlemi” (Bethlehem) at around the 4,000-meter level. The church is a popular way point for trekkers in the area, and can be reached by a steep 3 hour climb up the mountain, or around 30 minutes (6 km from the central square in the village Stephantsminda) by jeep up a rough mountain trail.